Player 1? You are up! HISTORY LESSON: Pinball machines were originally made without flippers. Winning was a matter of chance, thus the flashy games were little more than well-lit gambling devices functioning as slot machines. During the 1940s, these flipperless diversions were deemed hazardous to society and were banned in most major U.S. cities. The advent of the flipper in 1947 began to change how and why the game was played. It is commonly said that most, if not all, bans were lifted by 1976, which is when New York City finally ended its pinball machine prohibition. 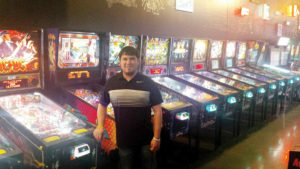 During the 12 months preceding Iowa’s 2018 State Championships put on by the International Flipper Pinball Association (IFPA), more than 11,000 pinball players played nationally in 2,000-plus competitions. Only 704 of these competitors remained eligible to win the 2018 national championship. But in order to advance to nationals, each player would first have to qualify by winning his or her state tournament. Iowa’s 16 best flippers gathered in West Glen’s Operating Room on Jan. 20 for a one-day, March Madness-style single elimination tournament. The last man or woman standing would be called the state champion and represent Iowa in Las Vegas in March. After a long day of flipping, the finals featured a showdown between Cody McQuiston and his friend, Sawyer Herweh. Each round of tournament play consists of a best-of-seven series. amongst the players and various levels of familiarity with the assorted games affect the player’s ability to achieve high scores. As such, choosing which game to play, and in what order, is a significant part of the competition. Despite his prowess, Herweh found a way to win. The loser of the previous game gets to either choose what is played next or choose to play second — it is an advantage to know what score is needed win. McQuiston opted to play second, and Herweh went for the jugular. With his back to the wall, McQuiston thwarted Herweh’s efforts and won. Herweh deferred the choice for Game 3 in order to play second. McQuiston raced to a big lead on The Hobbit, his third favorite game, but Herweh rallied and managed to squeak out enough points to win on his third ball. “The rest of the games are kind of even for me,” says McQuiston, so he opted to play second. Herweh went with Metallica, but couldn’t overcome two early multi balls by his opponent. McQuiston jumped out to an insurmountable lead and won. After the loss, Herweh deferred, and McQuiston decided to mix things up. It was now or never for Herweh. He dialed up his best game: Dialed In. The victory sealed McQuiston’s championship and the opportunity to compete at nationals. He figures to be an underdog but appreciates the opportunity.